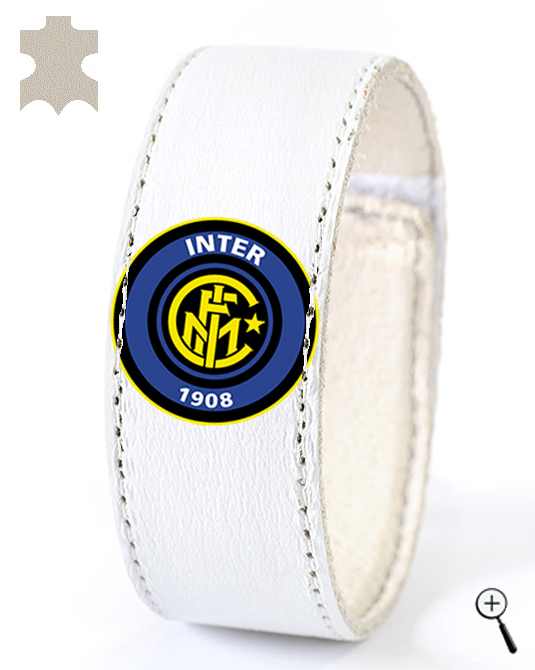 Inter is an Italian professional football club, founded in 1908. The first president of the club is Giovanni Paramitioti. During the 1909-1910 season, under the leadership of the President Carlo de 'Medici, Inter won its first national title. In season 1929-1930, which is the first official season in the Italian Serie A of the Championship, Inter won their third national title. Inter won its fourth championship in season 1937-1938. In 1939 Inter won their first Coppa Italia, and the following year came the turn of the fifth championship title. Thirteen years have passed until the next championship title of Inter. In 1952, the club's coach is Alfredo Foni who have unattractive and defensive style of play, but very efficient. This is how - with perfect defence, Inter won their sixth championship in 1953. Despite the success Foni was criticized for the team's defensive play. So he decided to introduce a new more attractive and offensive pattern of play next season. The result is impressive. Inter formed a great attack. In 1954, completely naturally, Inter became champion of Italy - for the seventh time. In 1955, Inter was bought by Angelo Moratti. After several years in Milan arrives Elenio Herrera – the coach with the colossal contribution to the team of Inter. 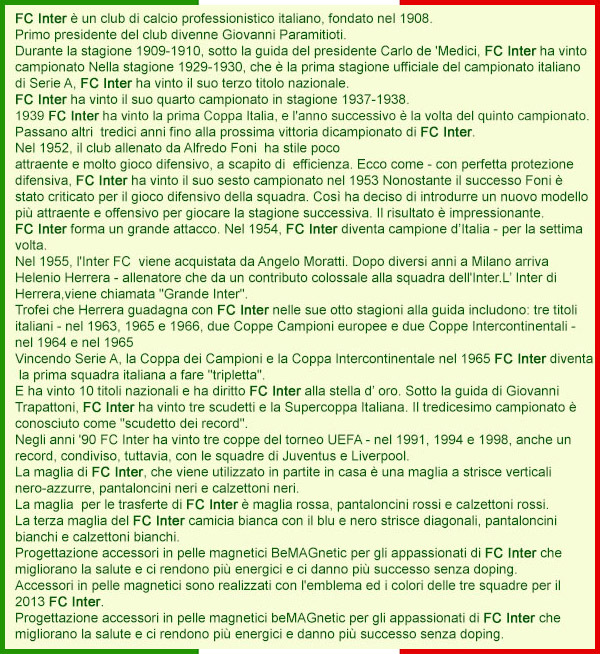 Herrera’s Inter was called the "Great Inter". By winning Serie A, the European Cup and the Intercontinental Cup in 1965 FC Inter became the first Italian team made "treble". And the won 10 national titles entitle Inter with gold star. Under the guidance of Giovanni Trapattoni, Inter won three champion titles and the Italian Super Cup. Thirteenth championship is known as "Scudetto of Records." 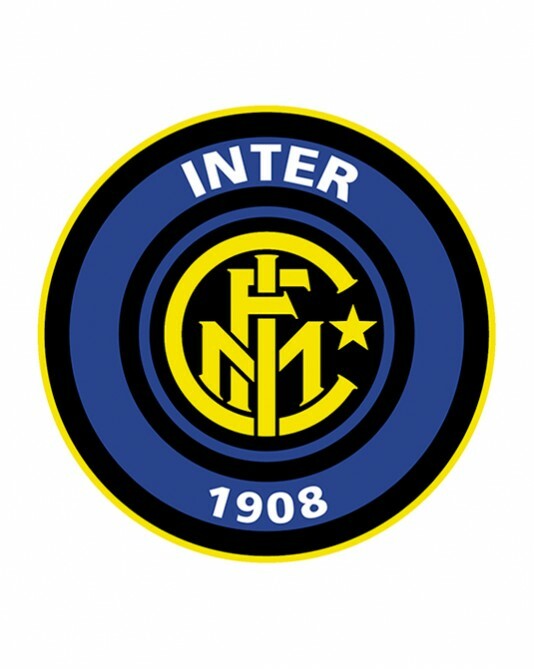 In the 90s FC Inter won three cups of the UEFA tournament - in 1991, 1994 and 1998, also a record, shared, however, with teams of Juventus and Liverpool. The home kit of Inter Milan is a black shirt on blue vertical stripes, black shorts and black socks. 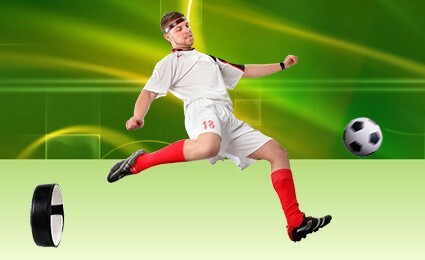 The away kitt of Inter red shirt, red shorts and red socks. The third kit of Inter is white shirt with blue and black diagonal stripes, white shorts and white socks. 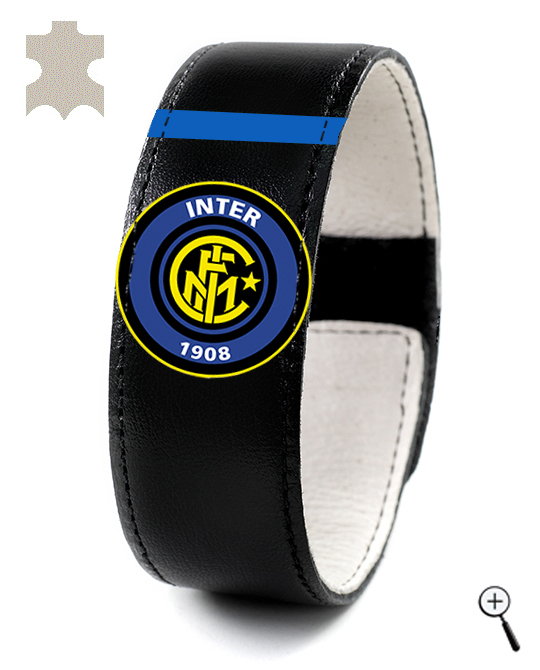 BeMAGnetic design magnetic leather accessories for fans of Inter that improve health and make people more energetic and more successful without doping. 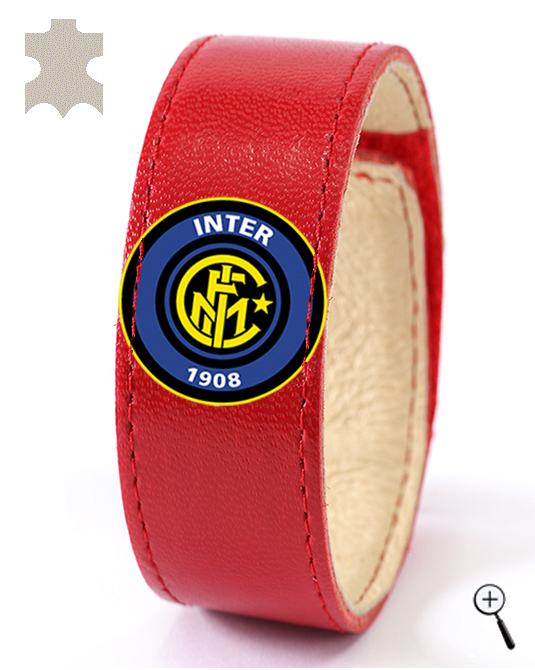 The magnetic leather accessories are made with the emblem and colors of the three kits of Inter for the year 2013.